This salmon patties recipe is just a real treasure. It is a "keeper" in my file of kosher for Passover recipes because I can serve it at the Yom Tov table and tote them around on picnic chol hamoed. The filler of mashed vegetables make this a healthy recipe. And it doesn't hurt that kids of all ages just love them. Adapted from Spice and Spirit . 1. Place potato, zucchini and carrot in a large sauce pan, cover with water and boil over medium high heat until vegetables are very tender. Drain and mash well. 2. In a medium sized mixing bowl combine cooked, mashed vegetables, salmon, eggs, lemon juice, mayonnaise, celery, onion, bread crumbs or matzoh meal, salt and pepper. Mix well. 3. In a large skillet over medium high heat, pour in oil. 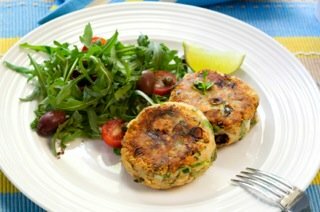 Make a few patties of desired size, heaping tablespoons for small salmon patties or 1/4 measuring cup for larger ones. When oil is hot, gently add salmon patties and fry 3 to 5 minutes per side or until golden. Add more oil to pan as needed. 4. Serve salmon patties recipe with Remoulade Sauce, warm or at room temperature.